Share the post "New Firmware v30.0.015 Out For The N95"
dude i dont find any update for my nokia RM-159 ??? Since I upated to v30. The GPS no longer locks. It used to take less than 10 seconds to lock onto a signal. Now it just sits there. Not sure if it locks on eventually buts is definatly more than 10seconds. I’ve the same problem after upgrading to v30, GPS takes more than 2 min. to lock. 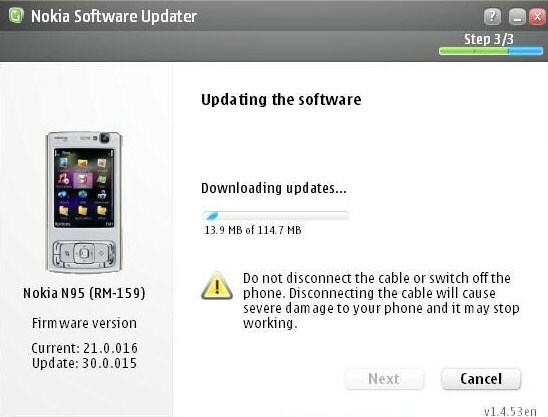 The Nokia update program said that there is no update available (latest v20) …. The latest version of the update software keeps telling me that my phone is up to date but the version is 12.0.013… Could someone please help me out..? I cracked the GPS locking problem. It seems after the update I no longer had a default access point defined for the GPS lock. So i pointed to my default internet access point (in this case vodafone). Seems to lock on very quick now as before in around 10 seconds.